Edinboro and Millersville put on a thrilling match Saturday, giving Edinboro their first home soccer win of the season, 4-2. 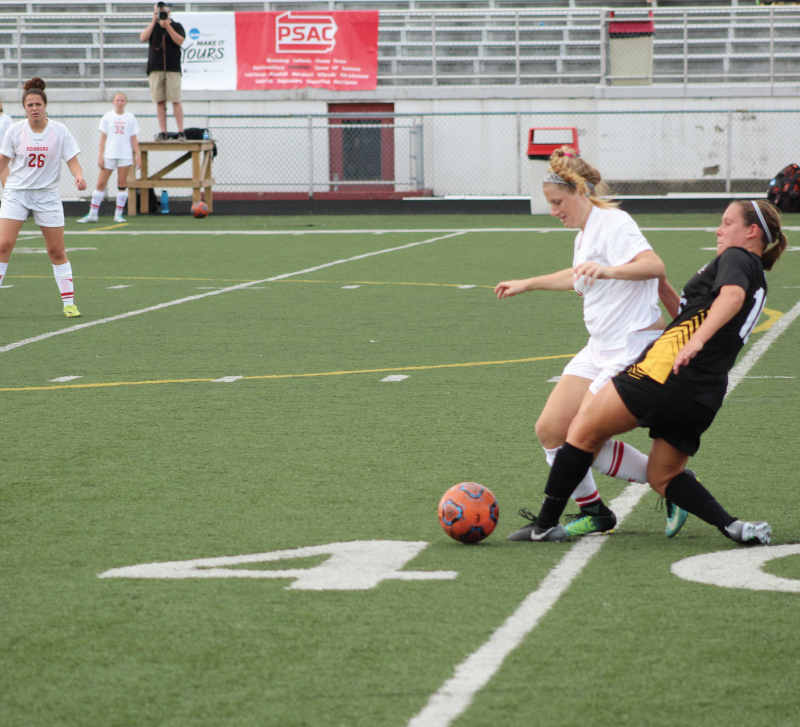 A pass from Sarah Reidy would give Edinboro’s Danielle Chatten the first goal of the game, 89 seconds into the match. Six minutes later, Ashley Mutkus would double Edinboro’s lead with her fifth goal of the season from a Rebecca Manns assist. Lauren Downey would put up a goal for Millersville minutes later. Chatten and Reidy would combine for another goal at 15:15, two minutes after Millersville’s goal. Kate Phillips would replace Kaita Mujica in goal for Millersville at 17:54. Chatten was given a yellow card at 2:15. There would be no more goals in the first half, leaving the score at 3-1. Freshman Faith Reash would open scoring in the second half with her first goal for Edinboro. Reash was assisted by freshman Jill Jones, with the assist being Jones’ first career point with Edinboro. Millersville would conclude the scoring at 81:15, with a penalty shot from Delaney Meadows. Both teams received yellows in the second half, with Edinboro’s Coleen Brodman at 63:56. Millersville received a yellow at 81:40. Edinboro’s Sarah Baskey made six saves in the game. Millersville’s goalies combined for six saves throughout the game. Mutkus scored her fifth goal of the season and her 28th goal of her career. She is currently tied with Alex Brown, at 8th, for most goals scored with the team in Edinboro history. She earned a spot, at 10th, for most career points in team history. After the game, senior Mutkus stopped to talk about some of the challenges. “The heat was a mental hurdle that we had to deal with.” Mutkus also added that the battles for “50/50 balls” was really what made the difference. Finally on a winning streak, the Scots will look to extend their luck this Sunday against Kutztown at Sox Harrison Stadium. There will be another home game against Mercyhurst on Wednesday, Sept. 27. Erica Berkholder is a staff writer for The Spectator.